With 30 years of experience, Kompass has the learning required to meet your flexible packaging needs. We employ a global-standard of leading technology to enable us to offer you unrivaled quality. Our client base is vast and their trust in us allows us continued success in our third decade of operation. As one of the industry's leaders, our reputation of delivering on-time and on-budget is unsurpassed. We employ the latest methods and utilise the most current technology. From the outset, your solution begins to take shape. This allows us to foster an atmosphere of exploration, innovation and passion. Kompass Pakistan's core products are low, medium and high barrier films and laminates with PE,PA,Al-foil BOPP, PET, MBOPP, MPET, CPP, MCPP and custom-made laminates. We're pleased to announce our expansion into gravure printing. Gravure printing and etching is part of our constant push to expand our service offering. 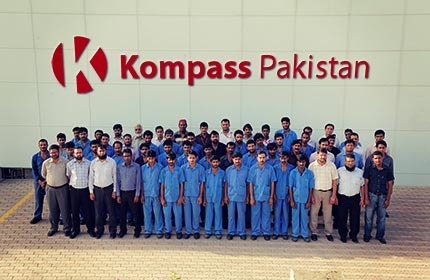 Based in Karachi, Kompass Pakistan was founded in 1985 and quickly rose to become one of the leading producers of flexible plastic packaging in Pakistan. As demand for flexible packaging has risen, so has our expertise and capabilities. Our extensive expertise in films & printing allows us to meet your stringent requirements. In three decades of business, we have continually exceeded the high expectations of our varied clientele.